Shadows, shapes and dancing light. A blue and green world, illuminated beyond our dreams. Undulating, flickering tongue, bringing a world of scents and secrets. Seeing past the ends of the rainbow and into the darkness. Dimensions merging into one another as beings move among them. Gazing unafraid into the fiery depths of the sun. This is the vision of the serpent. Cultures around the world honor the Serpent as the possessor of a direct connection to Source, to the spirit of Life itself. 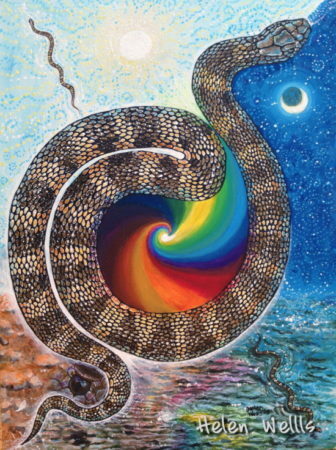 Serpent is seen as a bringer of prosperity, abundance, fertility, and wisdom. 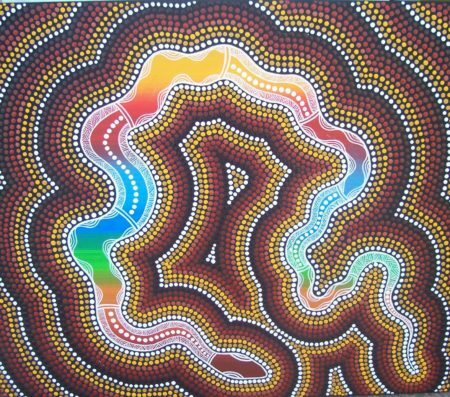 In many places, including among the peoples of Australia, South America, Africa, India, China, and Europe, Serpents are thought to gain their extraordinary wisdom through their visionary powers. Serpents are believed to see through the veils of the worlds and beyond time, giving them access to eternal wisdom and the infinite hidden secrets of the world. 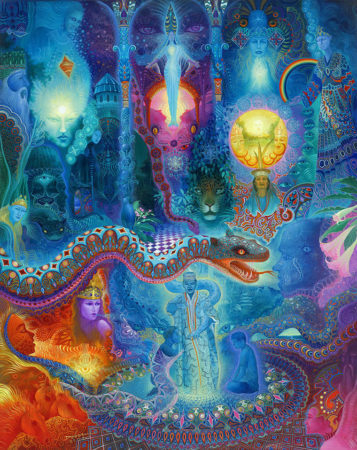 Serpent vision is truly unique, and gives them exceptional ability to uncover magical secrets within our shared world. Serpents are able to hunt and thrive in total darkness, when humans are blind and helpless. They also are capable of seeing even in scorching sunlight, when humans are equally blind and helpless. They are able to accomplish these superhuman visionary feats thanks to special gifts from Nature. Some species of Serpent possess heat pits—special organs that allow them to sense heat. These heat signals are processed by the Serpent’s visual cortex, the part of the brain responsible for vision. Serpents literally see heat, allowing them to see beyond the red end of the rainbow and into the infrared. Serpents see heat radiating from rocks, the warmth left behind when you leave a seat, and even the tiny traces of heat from warm furry mouse bodies in total darkness! 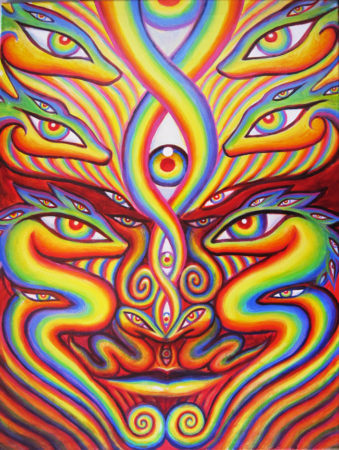 Serpents are also able to see in blindingly bright light, thanks to their sensitive visionary gifts. Serpents’ eyes are highly sensitive to ultraviolet (UV) light, which they are not only able to detect—their eyes actually possess a thin lens to filters out UV light, allowing them to retain their vision even under blinding conditions. Serpents see past the rainbow into ultraviolet dimensions—and they are able to protect themselves from this unbearably strong light! We have so much to learn from Serpents’ ability to perceive such extreme conditions with equanimity. 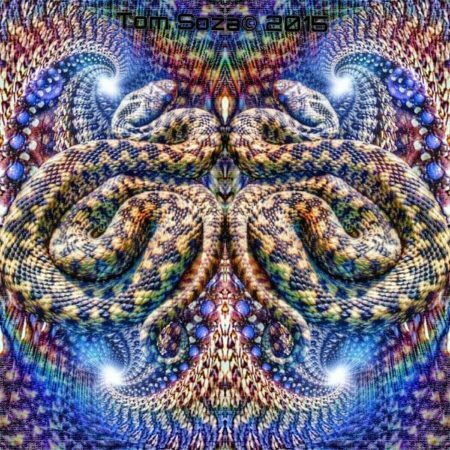 Those new to the visionary powers of serpents may wonder if their vision is truly so remarkable, and often ask if serpents are able to see in color as humans do, as well as their other extraordinary ocular abilities. Contrary to popular belief, serpents can see color—but they don’t see it quite the way humans do. We are trichromatic, possessing 3 kinds of cones in our eyes that help us see red, blue, and green. Serpents are dichromatic, possessing cones for green and blue. Thus, serpents exist in a world of blues and greens, almost like an underwater paradise. While they can’t see the many shades of red and orange that make a sunset so beautiful to us, they are able to see past the sunset and into the beautiful sea of blue and green dusky darkness that becomes so frightening to us—as well as the beauty of a green forest, in ways we can only imagine! Some reptile keepers claim that because serpents can’t see red, using a red light as heating mechanism will not bother them. However, since serpents are sensitive to light and shadow even when not detecting color, the additional light in their living space during the night can and does affect some serpents negatively, leading to stress, poor eating, and potentially more serious health problems. Because serpents are so sensitive, it is preferable to provide a heat source that is not ALSO a light source. While the serpent will be able to “see” the heat, it will not have to work to sort out heat from light, and will be able to rest more comfortably. We recommend ceramic bulbs for all over-tank heating arrangements. Serpents are masters of vision and integration of their senses, allowing them to attune more precisely to their environment and deepening their connection with the many small magics that surround us every day. From them, we can learn to peel away our old visions and become more present and aware, and we can learn to expand our ideas of what is possible. Serpents teach us to see beyond the world as we know it, and to envision a more beautiful and complete world.